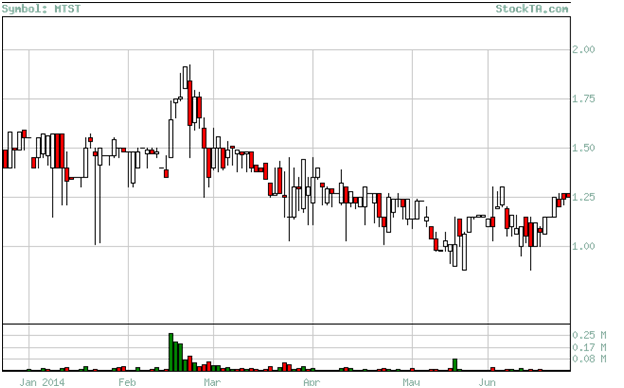 Today we are initiating coverage of what we believe is the next great cancer diagnostics stock. Its tools address four of the most deadly cancers and are primed to come to market with a unique and highly effective product that does not require FDA approval. Therefore its flagship product will be available for sale in about a year or so. Developed in collaboration with some of the nation’s leading institutions, MetaStat (OTC – MTST) seeks to predict the probability of cancer’s spread through the design and rollout of its platform-based proprietary diagnostic products. MetaStat’s initial focus is on diagnostic tests for breast cancer. Commercialization should occur during 2015 with additional products expected to enter the market in 2016 and beyond. This pure-play cancer diagnostics company addresses a huge unmet medical need in the understanding of cancer metastasis and its care, since metastasis of solid tumor, epithelial-based cancer accounts for 90% of cancer mortality. Metastasis is the process by which cancer spreads from a primary tumor through the bloodstream to other areas of the body and is responsible for approximately 90% of all deaths. Using MetaStat’s tools, physicians can better treat their patients, by identifying high-risk patients who need aggressive therapy and preventing unnecessary chemotherapy that ultimately degrades quality of life for many low-risk patients that are currently over-treated. Given the huge market opportunity, a series of upcoming milestones, limited competition, low pricing, and a uniquely valuable ability to help patients and physicians customize cancer treatment decisions, we believe MetaStat is poised to emerge as the next major diagnostic tools company. Based on our current financial projections and MetaStat’s commercialization plans, we believe these shares could trade at a premium to the company’s peer group. As a result, we rate shares Speculative Buy with a 12-month $5 price target. MetaStat is a life sciences company that develops and commercializes diagnostic products and novel therapeutics for the early and reliable prediction and treatment of systemic metastasis, the process by which cancer spreads from a primary tumor through the bloodstream to other areas of the body. MetaStat is focused on breast, prostate, lung and colorectal cancers, where systemic metastasis is responsible for approximately 90% of all deaths. Both the MetaSite Breast™ and MenaCalc™ product lines are designed to accurately stratify patients based on their individual risk of metastasis and to allow clinicians to better "customize" cancer treatment decisions. The National Institutes of Health estimates overall costs of cancer to exceed $250 billion, including direct medical costs and the cost of lost productivity due to illness and premature death. MetaStat’s diagnostic offerings target four of the most dangerous forms of cancer, which kills more than 277,000 people annually. Developed in collaboration with some of the nation’s leading institutions, MetaStat seeks to predict the probability of cancer’s spread through the design and rollout of its platform-based proprietary diagnostic products. MetaStat’s initial focus is on diagnostic tests for breast cancer. Commercialization should occur during 2015 with additional products expected to enter the market in 2016 and beyond. This pure-play cancer diagnostics company addresses a huge unmet medical need in the understanding of cancer metastasis and its care, since metastasis of solid tumor, epithelial-based cancer accounts for 90% of cancer mortality. Using MetaStat’s tools, physicians can better treat their patients, by identifying high-risk patients who need aggressive therapy and preventing unnecessary chemotherapy that ultimately degrades quality of life for many low-risk patients that are currently over-treated. Given the huge market opportunity, limited competition, low pricing, and a uniquely valuable ability to help patients and physicians customize cancer treatment decisions, we believe MetaStat is poised to emerge as the next major diagnostic tools company. Based on our current financial projections and MetaStat’s commercialization plans, we believe these shares could trade at a premium to the company’s peer group. As a result, we rate shares Speculative Buy with a 12-month $5 price target. Predicting the probability of cancer’s spread is MetaStat’s mission, one that has resulted in the development of proprietary diagnostic products for disease of the breast, prostate, lung and colon. Towards a goal of becoming a full-service oncology firm, the company plans to offer a treatment for systemic metastasis, as a valuable complement to its line of analytics. MetaStat’s initial focus is on diagnostic tests for breast cancer. Commercialization should occur during 2015. Additional diagnostic products are expected to enter the market in 2016 and beyond. Because metastasis of solid tumor, epithelial-based cancer accounts for 90% of cancer mortality, there is a strong unmet medical need to more accurately identify the risk of metastatic spread. MetaStat offers two early and reliable predictors: the MetaSite Breast™ Test and MenaCalc™ diagnostic product lines. With these, oncologists can customize cancer treatment by identifying high-risk patients and prevent others from unnecessary, prolonged, painful and expensive chemotherapy, with improved patient outcomes as a result. MetaStat’s technologies comprise a platform, based on a common pathway for metastatic development of solid epithelial-based tumors and the result of over 15 years of collaboration with venerated institutions such as the Massachusetts Institute of Technology, Albert Einstein College of Medicine of Yeshiva University, Cornell University, and the IFO-Regina Elena Cancer Institute in Rome, Italy. An acute understanding of what underlies systemic metastasis led to discovery of the Mena (mammalian enabled) protein that acts as a key in cellular migration. Mena proteins exist in abundance in the fetus but disappear almost entirely after birth. However, in metastasizing cancer Mena proteins congregate in large amounts, direct dangerous tumor progression, and expresses in a variety of cancers. Further discovery found "windows," or sites along the blood vessel where cancer gains entry by squeezing through to spread to other areas of the body, beginning their metastatic cascade. Researchers call these windows the Tumor Microenvironment of Metastasis (TMEM) that consist of a trio of cells, one of which is a tumor cell that produces Mena. MetaStat has named them "MetaSites," the origin of metastasis in the bloodstream. Armed with knowledge of the MetaSite and, though discovery of variations of the Mena protein called isoforms, MetaStat has formed the basis for its diagnostics of the probability of distant cancer metastasis. 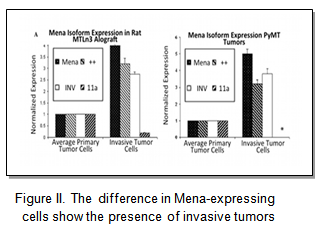 MetaStat technology harnesses the isoforms that either cause further invasion of cancer cells into tissue (MenaINV) or exert the more beneficial effect by preventing cells from allowing tumor migration into the blood (Mena 11A). Using the Mena isoforms, MetaStat’s tools predict cancer’s spread by measuring relative levels of MenaINV against Mena11A. The MetaSite Breast™ and MenaCalc™ diagnostics, through more accurate prediction of systemic metastasis probabilities, will allow doctors to customize cancer treatment by placing patients in risk categories so that harmful and unneeded chemotherapy can be avoided. Using immunohistochemistry, the process of detecting proteins in cells of a tissue section, the test is one step in providing physicians with specific information about a patient’s early-stage tumor and its potential for metastasis based on the presence and density of MetaSites, known as a "Metastasis Score." For example, a high concentration of MetaSites is positively correlated with cancer spread. Patients are characterized as having low, intermediate or high risk of metastasis within ten years of their initial diagnosis. Because MetaStat efficiently uses a section of samples already taken by biopsy at the patient’s clinic, no new equipment or procedures are needed; transference to MetaStat’s reference laboratory is all that is required. Samples are easily preserved in wax and shipped immediately. Turnaround time for MetaStat’s analysis is within seven days, typically the time it takes for a standard pathology lab to deliver results. Most importantly, the Metastasis Score is received well before treatment options like radiation or chemotherapy are decided upon. Validation of the MetaSite Breast™ Test has been made in three human clinical studies. Notably, results of a 60-patient trial were published in Clinical Cancer Research and showed the test’s ability to predict probability of systemic metastasis. The trial’s design retrospectively matched 30 pairs of women for age, tumor size and grade, and other salient characteristics, and found that MetaSite density was significantly greater in those who eventually developed systemic metastasis. A “Large Population Validation” study of the MetaSite Breast™ Test was done under a Sponsored Research Agreement with Albert Einstein and Cornell, to determine the optimal point of linking MetaSite density upon initial diagnosis of breast cancer with the risk of systemic metastasis. This was a 10-year retrospective study using pre-collected tissue samples from 259 metastatic and 259 non-metastatic patients matched in the same way as described above. Results were compared to known outcomes, and showed the Metastasis Score clearly predicted risk of metastasis in a certain subset of breast cancer patients (ER+/HER2-), a group that comprises 60% of the total. The study was published recently in the Journal of the National Cancer Institute; it included data showing superiority of MetaSite Breast™ to another commercial breast cancer diagnostic using immunohistochemistry. More studies are planned to augment the effectiveness of MetaSite Breast™, and to demonstrate an economic benefit that would result from avoiding chemotherapy and radiation. Studies of the latter are valuable when seeking special medical billing codes for reimbursement; although MetaStat’s tests are reimbursable under existing codes, new ones created expressly for the MetaSite Breast™ Test would support higher pricing. Designed to be used in conjunction with the MetaSite Breast™ Test, MenaCalc measures how far tumor cells progress by measuring the relative levels of Mena protein isoforms MenaINV against Mena11A. Invasive tumor cells can be deduced from calculating the difference between the isoforms of Mena-producing cells. Resulting MetaScores can predict risk of not only metastasis, but also survival. MenaCalc’s diagnostic, as a platform, is designed to apply more broadly to solid tumor epithelial-based cancers beyond breast, to prostate, colorectal and lung. Like the MetaSite Breast™ Test, MenaCalc™ fits perfectly in the pathology clinic’s process, requiring no additional equipment or procedures. Also like the MetaSite Breast™ Test, it is designed to effect actionable decisions in chemotherapy, radiation or surgery and to prove itself in cost-effectiveness. 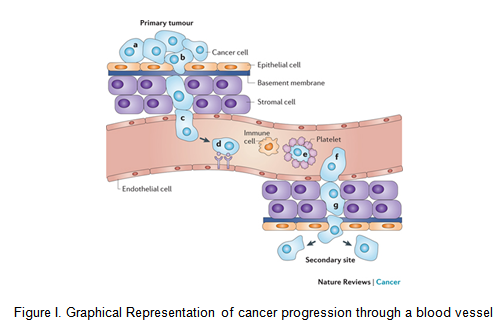 In 2010, MetaStat published a proof-of-concept study for MenaCalc™ in Breast Cancer Research, exploring the role of the Mena protein in a tumor’s growth and dispersion in the body as shown in Figure 2. Mice unable to produce the Mena protein or its isoforms were crossbred with mice genetically predisposed to spontaneously develop highly metastatic breast cancer tumors. While both groups developed tumors, mice lacking the Mena protein did not show systemic metastasis, exhibited a meaningful survival advantage, and lived longer lives. This is important because in tumor cells, overexpression of MenaINV and downregulation of Mena11a signal systemic metastasis. Two years later, MenaCalc™ was found to accurately predict survival in adenocarcinoma of the lung in a trial of 70 patients at Yale University. These positive results form the basis of a larger study to confirm findings. An additional study at the Massachusetts Institute of Technology, although small, showed MenaCalc™’s ability to predict metastasis in prostate cancer, warranting the preparation for further trials into this indication. MetaStat’s MenaCalc™ platform is efficient, needing only a small tissue sample regularly done by fine needle biopsy. Yet implications are vast, giving oncologists valuable information to direct treatment. In addition to breast cancer, MenaCalc™ is applicable to colorectal, prostate and lung cancer, opening up new markets for the company’s diagnostics in different tumor types with potential to predict the risk of metastasis and further change the landscape of treatment options. Leveraging MetaStat’s discovery and utilization of Mena’s biochemical pathway, the MenaBloc™ therapeutic is being developed to directly suppress and even eliminate cancer metastasis. Initial human Phase I trials are anticipated in 2017. MenaBloc’s scientific premise is based upon events within the cell’s nucleus that govern protein formation through gene splicing, thereby governing the course of disease. If successful, MetaStat will identify intercellular disease targets that lead to new classes of chemotherapy without systemic toxicity, which is the unfortunate legacy of current cancer therapies. Extensive Patent Portfolio Covering Core Technologies MetaStat owns an impressive collection of issued and pending patents for itsMetaSite Breast™ Test and MenaCalc™ diagnostic platforms. A total of ten patents are filed in the U.S., Europe, Canada and Singapore covering MetaSites, uses of the Mena protein in diagnosis and prognosis of tumors, gene expression and chemotherapeutic resistance in cancer cells, the prognosis of human metastatic risk, and quantitative screening for anti-metastasis treatment. Manufacturing and Marketing Focus on Cost Effectiveness MetaStat’s technology employs commonly-used tissue sample dyeing techniques to identify the types of cells that figure into its unique diagnostic, based on antibody stains where important information can be obtained from a single microscope slide. Augmenting this cost-effective philosophy, MetaStat will use contract manufacturers for producing, packaging and shipping its tests. To sell its diagnostics, MetaStat will concentrate on large cancer centers in key cities around the country, using contract representatives with oncology experience and established relationships in these centers. MetaStat will leverage its own relationships with reputable clinicians within the centers as part of its initial marketing approach. Education of practitioners and laboratory personnel will comprise a large part of MetaStat’s sales and marketing effort. Present and future peer-reviewed publications highlighting the value of the company’s diagnostics should give the marketing effort a significant push forward. Reimbursement from government and third-party payors is already established for diagnosic tests such as the ones MetaStat will market; however, the company will seek unique pricing, following a precedent set by certain competitors and based on MetaStat’s tests’ ability to help lower costs when chemotherapy is determined unnecessary. Initial tests to enter the market are expected to have a list price of $2,500, a savings over existing genomic tests and offering superior features. Cancer occurs when a single tissue cell becomes damaged through internal factors such as genetics, or from environmental forces, such as exposure to toxins. Proliferation of damage creates tumors that may result in malignancy. Metastatic disease is defined as the systemic spread of cancer from a primary tumor, through the bloodstream or lymph nodes, to other areas of the body. More than 600,000 Americans are expected to die of cancer this year, roughly 1,500 people per day, making it the second most common cause of death in the U.S., exceeded only by heart disease. In the U.S., cancer accounts for nearly one of every four deaths. The National Institutes of Health estimates overall costs of cancer to exceed $250 billion, including direct medical costs and the cost of lost productivity due to illness and premature death. Four of the most dangerous forms of cancer, their yearly incidence, and deaths per year are listed below and are the target for MetaStat’s diagnostic offerings. In patients with cancer of the breast, prostate, lung and colon, metastatic disease accounts for approximately 90% of patient deaths, creating a need for physicians to develop effective strategies for controlling cancer’s spread. Current methods of grading tumors are not entirely successful in predicting metastasis, and involvement of the lymph nodes, a widely-accepted conviction of systemic cancer invasion, is not always reliable. This becomes problematic when some patients may need chemotherapy at the time of diagnosis and others, at smaller risk, can be managed with watchful waiting. Because systemic chemotherapy can be devastating, killing both damaged and healthy cells, only patients who are at greater risk of metastasis should be chosen as candidates. In fact, the overall 15-year survival benefit in patients with breast cancer who have undergone chemotherapy is only between 3% and 10%. Yet 80% of newly-diagnosed breast cancer patients are subject to chemotherapy; because 40% eventually relapse into metastatic disease, many are needlessly subject to its short- and long-term adverse effects. As a result, many breast cancer patients are misclassified as being high risk for metastatic disease when in reality they are low risk, and vice versa. Thus, some women receive unnecessary chemotherapy or radiation, while others, not enough. Clearly, a better diagnostic tool is needed to ensure all patients presenting with breast cancer receive the proper level of care. A commonly-used test for breast cancer exists on the market – the Oncotype DX made by Genomic Health Inc. (NASDAQ - GHDX), although for the reasons cited above it may prove inferior to MetaStat’s breast cancer diagnostics including the MetaSite Breast™ Test and MenaCalc™. A trial was conducted in 44 women with breast cancer, comparing the MetaSite Breast™ Test to the Oncotype DX; analysis of the resulting scores showed enough of a difference to suggest larger studies will provide much more valuable information to doctors when deciding treatment options for their patients. Pricing between the tests varies significantly, favoring MetaStat: the Oncotype DX for breast cancer is list priced at $4,290 versus a suggested $2,500 for both the MetaSite Breast™ Test and MenaCalc™ combined. From a clinical standpoint, MetaStat’s tests assess the risk of metastasis as opposed to cancer cell proliferation and are more precise in identifying the level of metastasis risk. Existing and pending patents also provide a strong barrier to entry for MetaStat when its tests achieve commercialization. Dr. Bronsther was appointed CEO of MetaStat in December 2012 and has been Chief Medical Officer since April 2012. From 2005 to 2007, he served as Chairman of the Board of the National Transplant Network, and since 2008 has been Chairman, Section of General Surgery, at Inova Fairfax Hospital. Prior to that, Dr. Bronsther was Clinical Professor of Surgery at George Washington University. Dr. Bronsther is a Diplomat, American Board of Surgery, and was a Fellow in Liver Transplantation at the University of Pittsburgh Center. His editorial positions include Reviewer for the Journal of the American College of Surgeons, Transplantation, Transplant Proceedings, Liver Transplantation and Surgery, and the American Journal of Kidney Disease. Dr. Bronsther is the author of 63 peer-reviewed publications, seven books and book chapters, and has participated in over 30 invited lectures. Dr. Dreismann has headed the diagnostics effort at MetaStat since October 2013, bringing to the company over 24 years of experience in health care, most notably the early adoption of molecular biology’s polymerase chain reaction (PCR). Formerly, he was President and CEO of Roche Molecular Systems at Roche Group and from 1985 to 2006 also served as Head of Global Business Development for Roche Diagnostics. Dr. Dreismann serves on a number of boards of public and private healthcare companies. Dr. Buck has held this position since September 2013, leveraging her vast experience in preclinical pharmacology, translational research and biomarker discovery in oncology. Prior to this, Dr. Buck was Assistant Director of Advanced Preclinical Pharmacology at OSI Pharmaceuticals, part of Astellas Pharma US Inc., where she helped advance molecules in oncology toward commercialization. Dr. Buck is the author of more than 30 peer-reviewed publications and patents. Mr. Lau has been MetaStat’s President and Director since February 2012, and was appointed Chief Financial Officer in May 2012. He has been active in evaluating the company’s technology prior to its founding. Before this, Mr. Lau served as founder, President and CEO of biotechnology firms HoustonPharma, Inc. and PharmaFrontiers Corp., overseeing the latter’s acquisition of Opexa Pharmaceuticals. Mr. Lau also founded Adventrx Pharmaceuticals, Inc., serving as President and CEO during the acquisitions of Immune Complex Corp. and Biokeys Pharmaceuticals, Inc.
Mr. Schneiderman was appointed Vice President, Finance in December 2012 and has been Comptroller since February 2012. Formerly, he served as Senior Vice President of Burnham Hill Partners LLC, focused on investments for public and private equity in life sciences. 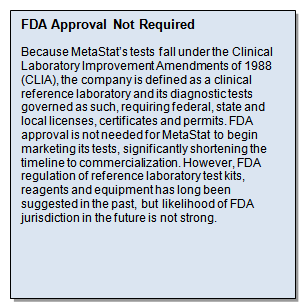 MetaStat’s technology, while based on validated science and using existing laboratory tools, is nonetheless at an early stage of development and as yet unproven in the marketplace. Clinical trial success is always a risk; delays may occur and funding may not be sufficient. Research and development for future diagnostic tests in other cancer indications could provide a meaningful and damaging drain on resources. Licenses and certifications for its clinical reference laboratory, especially when established in certain jurisdictions, can be daunting and subject to frequent and sometimes onerous auditing. Although the FDA has taken a regulatory back seat to CLIA, this could change. Reimbursement codes specific to MetaStat’s tests may not materialize – payors may view the diagnostics too recent and still at an investigational stage – and while not an immediate danger to revenue, this could impact premium pricing. Sales representatives may face the not-insignificant task of convincing doctors of the MetaSite Breast™ Test and MenaCalc™’s value and cost-effectiveness, turning efforts into a "missionary sale" that could hamper revenue growth. Practitioner acceptance will need to be gained for ultimate success, although the company’s existing scientific results and peer-reviewed data should help greatly toward this end. Competition is a key risk for the company, not only from molecular diagnostics (despite their drawbacks), but from standard test kits commonly used by pathologists and oncologists within their own laboratory. Larger pharmaceutical and diagnostic companies like Novartis Pharmaceuticals Division, part of Novartis AG (NYSE - NVS), Roche Diagnostics, a division of Roche Holding AG (OTC - RHHBY), Quest Diagnostics Inc. (NYSE - DGX) and Laboratory Corporation of America Holdings (NYSE - LH) continually develop tests with extensive marketing efforts, making competition more strenuous. Given the enormous markets MetaStat’s diagnostic tests address, revenues can be potentially substantial, and due to its relatively low cost of production, gross margins could surpass those of the industry reaching as high as 80%. By taking very conservative market penetrations of annual incidence of the cancer types MetaStat’s tests will serve, preliminary revenue projections were derived (without accounting for yearly growth in new cancer patients). Margins comparable to diagnostic industry publicly-traded peers were used, also conservative given MetaStat’s expectation to leverage its in-house platform of diagnostic tests when developing ones for new cancer indications. Bringing projections out to a terminal year consistent with MetaStat’s proposed pipeline, yearly earnings per share were calculated and subjected to a discounted cash flow metric. Discount rate used is a combination of risk-free rate based on long Treasury yields and a market risk premium. At present, we forecast around $3M in revenue in 2015, which assumes commercialization occurs in the second half of the year. With high margins and relatively low operating expenses, with sales reaching well over the $100M mark in 2018 and operating profitability to likely first occur in early 2017. A forward price/earnings multiple was chosen based on comparable peer diagnostic companies including Quest Diagnostics, Laboratory Corporation of America and Bio-Reference Laboratories, Inc. (BRLI). The resulting target price derived is $5 per share within a 12-month time frame. MetaStat, Inc. is a pure-play cancer diagnostics company offering proprietary products to address a huge unmet medical need in the understanding of cancer metastasis and its care. Using MetaStat’s tools, physicians can better treat their patients, preventing unnecessary chemotherapy and radiation that ultimately degrades quality of life. The competitive arena for the type of quality products MetaStat will offer is limited, and commercialization, coming in the very near future, will be embraced by the oncology community. Large medical markets exist for MetaStat to expand into, and the company’s efficient leverage of its diagnostic platform should benefit future earnings. Shares at current levels are hugely undervalued in light of MetaStat’s potential in the industry of cancer diagnostics and its impact on human lives. Goldman Small Cap Research, (a division of Two Triangle Consulting Group, LLC) produces research via two formats: Goldman Select Research and Goldman Opportunity Research.The Select format reflects the Firm’s internally generated stock ideas along with economic and stock market outlooks. Opportunity Research reports, updates and Microcap Hot Topics articles reflect sponsored (paid) research but can also include non-sponsored micro cap research ideas that typically carry greater risks than those stocks covered in the Select Research category. It is important to note that while we may track performance separately, we utilize many of the same coverage criteria in determining coverage of all stocks in both research formats. Research reports on profiled stocks in the Opportunity Research format typically have a higher risk profile, and may offer greater upside. Goldman Small Cap Research was compensated by a third party in the amount of $15,000 for a research subscription and distribution service. All information contained in this report was provided by the Company via filings, press releases or its website, or through our own due diligence. Our analysts are responsible only to the public, and are paid in advance to eliminate pecuniary interests, retain editorial control, and ensure independence. Analysts are compensated on a per report basis and not on the basis of his/her recommendations. The information used and statements of fact made have been obtained from sources considered reliable but we neither guarantee nor represent the completeness or accuracy.Goldman Small Cap Research did not make an independent investigation or inquiry as to the accuracy of any information provided by the Company, or other firms. Goldman Small Cap Research relied solely upon information provided by the Company through its filings, press releases, presentations, and through its own internal due diligence for accuracy and completeness. Such information and the opinions expressed are subject to change without notice. A Goldman Small Cap Research report or note is not intended as an offering, recommendation, or a solicitation of an offer to buy or sell the securities mentioned or discussed. Please “Like” our fan page on Facebook and follow us on Twitter.